What are the benefits of chia seeds? Well, superfood nuts and seeds enhance strength and stamina. These wondrous foods boost your body’s development, anti-inflammation and repair mechanisms, providing easy-to-digest protein and polyunsaturated omega-3 fatty acids. The benefits of chia seeds are best understood in the context of how superfoods, in general, make you healthier. Adding a handful of these near-magical nuts and seeds to your meals daily can improve your health, stamina and resistance to illness. 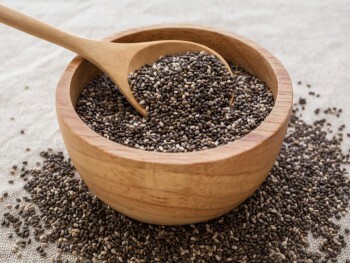 To appreciate the benefits of chia seeds, you must know a little about this superfood itself. Chia seeds are edible seeds from a native Mexican desert plant called Salvia hispanica. In the Mayan language, ‘chia’ means ‘strength’. 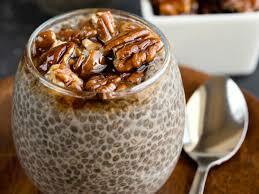 The benefits of chia seeds were well understood by Mayans and Aztecs who made this an integral part of their diet. No wonder they enjoyed such strength, energy and stamina! In modern times, chia seeds are often called “runner’s food”. One of the biggest benefits of chia seeds is that it’s a concentrated source of carbohydrates that are used to generate energy in the body. It’s also a source of multiple vitamins, anti-inflammatory omega-3 fatty acids, various minerals, and anti-oxidants. It’s incredible just how many powerful health-promoting compounds are densely packed into these tiny black and white chia seeds. These benefits of chia seeds are what have made it widely adopted amongst health-conscious consumers in today’s world. Chia seeds are not only a good source of energy thanks to its high carbohydrate and protein concentration, they also contain minerals like iron, magnesium and calcium. Iron helps produce hemoglobin in blood cells. Magnesium plays a role in stress reduction. And calcium keeps your bones strong and sturdy. A 30 gram serving of chia seeds contains 179 mg of calcium… that’s almost a fifth of an adult’s daily requirement of calcium! It’s more than you’ll get from drinking half a cup of milk. Another of the benefits of chia seeds is that, although the seeds are rich in fat, 80% of it is in the form of linolenic acid, an omega-3 fatty acid which is heart-healthy. Chia seeds are a great source of dietary fiber. With about 10 grams of fiber per serving of an ounce, chia seeds can deliver nearly half your daily requirement of dietary fiber. An interesting feature of chia seeds is the way they soak up water to expand within minutes. As they do that inside the stomach, chia seeds slow down the digestive process, and the release of sugar into the bloodstream. Those with diabetes, or who are trying to lose weight, swear by these benefits of chia seeds to control and regulate blood sugar levels which lead to fewer hunger pangs and food cravings that defeat most dieters. It is also through this property that chia seeds improve blood sugars and eliminate risk factors for heart disease. Experiments on animals fed chia seeds suggests they may improve insulin resistance, return blood lipid levels to normal, and avoid the deposition of visceral fat. Even a small supplement of diets by 5% with chia seeds achieved this benefit. Similar results have been reported in human studies also. A 2007 report in Diabetes Care claimed that including two and half tablespoons of chia seeds in diets of patients with type 2 diabetes mellitus helped lower blood pressure and other signs of inflammation. Another study in 2010 reported in the European Journal of Clinical Nutrition suggested that a similar intake of chia seeds brought down blood sugar levels after eating. 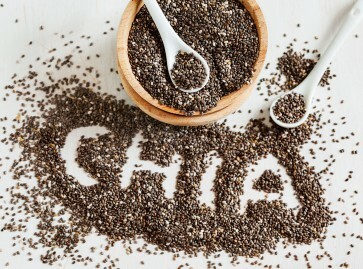 Why Add Chia Seeds To Your Diet? The benefits of chia seeds in improving health and avoiding disease seem convincing and proven by extensive experiments and studies. Yet putting this into practice isn’t easy. With widespread awareness of the benefits of chia seeds, most supermarkets and health food stores stock these superfoods. So it’s no longer difficult to find chia seeds. Adding an ounce to salads, smoothies and cereal can deliver a boost of fiber, protein, healthy fat and calcium. Flaxseeds are almost as good as chia seeds, except that the latter don’t need to be ground for absorption in the stomach. If you want to add it to bread or dough, chia seeds can be grinded for baking. This entry was posted in Health & Wellness and tagged benefits of chia seeds, chia seed superfood, superfoods on November 11, 2018 by Healthy Living Guide.